SICE Annual Conference 2010 in Taiwan was successfully finished!! 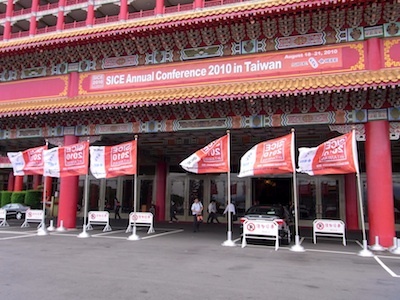 We would like to cordially thank you for your participation in SICE Annual Conference 2010 in Taiwan. 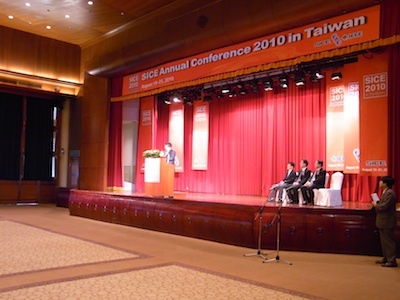 The SICE Annual Conference 2010 (SICE 2010) — SICE Anytime Everywhere —, an international conference on instrumentation, control and information technology, will be held at The Grand Hotel, Taipei, Taiwan on August 18 — 21, 2010. Since the establishment in 1961, SICE has been a leading academic society in Japan for a wide range of fields including measurement, control, system/information, system integration, and related industrial applications. The SICE Annual Conference has started its history in 1962. Since 2002 the official language of the conference is English for global activities. SICE 2010 is the second annual conference held outside Japan, in cooperation with the Chinese Automatic Control Society, Taiwan. The technical program of SICE 2010 will include Plenary Talks, Invited Lectures, and Workshops, in addition to Oral and Interactive Sessions. We have received more than 800 submissions. Thank you very much for your contributions. Paper Submissions and proposals for Organized Sessions and Workshops are encouraged. All the presented papers will be included in the IEEE Xplore Digital Library. The details of the submission and proposal procedures will be available at this conference web page. Organized Session List was updated. SICE Annual Conference 2010 in Taiwan started!! Bus Information from Taiwan Taoyuan Internationalto the Grand Hotel was updated.